Open Europe: Sarkozy held in custody: A blow to his mooted comeback and a gift to Le Pen? 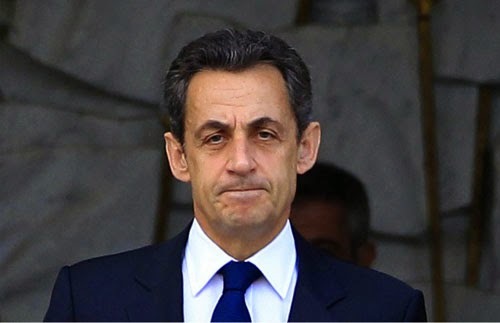 Nicolas Sarkozy has been detained for questioning by the French judicial police this morning, over allegations of influence-peddling (trafic d'influence). No formal charges have been brought so far, but prosecutors are investigating whether Sarkozy had promised to help a high-ranking French judge get a lucrative job in Monaco in return for insider information about other investigations relating to the financing of Sarkozy's presidential campaign in 2007. This story emerged from the wiretapping of phone calls between Sarkozy and his lawyer, Thierry Herzog, that French prosecutors had started last year as part of a separate case - the alleged financing of Sarkozy's presidential campaign by the Gaddafi family. According to the French media, the conversations revealed that Sarkozy and his lawyer were not only receiving confidential information on the on-going investigations, but were even aware of being wiretapped - given that Sarkozy had reportedly bought a new mobile and was using it to talk to his lawyer under the pseudonym Paul Bismuth. We will see how the investigation evolves, but it could have important implications. Over the past few months, Sarkozy's political comeback has looked increasingly like a matter of when, not if. A few of his closest allies seem to think the former French President is the only one who can preserve the unity of the centre-right UMP party. Indeed, Sarkozy could decide it is time to come back precisely in light of this scandal - engaging in a Berlusconi-style crusade against politicised judges. But it is far from clear whether the French electorate would buy this. In the meantime, Front National leader Marine Le Pen is waiting in the wings, and could come out as the big winner. France's last two centre-right presidents, Jacques Chirac and now Sarkozy, have both been hit by legal scandals. It could be a great argument to persuade disaffected voters to shift to Front National. Who knows whether these charges are valid? This looks increasing like the charges are politically motivated. What a novel way to eliminate the opposition--just have the police "detain" them while under investigation, which probably can take a very long time. "Sarkozy held in custody: A blow to his mooted comeback and a gift to Le Pen?" And a gift to us all too. Sarko is just a pure politician and a cause of ongoing disquiet when it comes to the EU. I seem to remember him telling us all that he "had fixed" the MananaZone problems. Well, guess what Sarko you lied! What is a little bit of fiddling compared to the down right treason, of having a vote against the Maastricht treaty, but ignoring it? It ranks alongside Cast-Iron-Pledge-Cameron's treachery. Morals in the EU are at an all time low. Is the UK's new man in Brussels a dark horse?